Discussions about product bugs & problems! 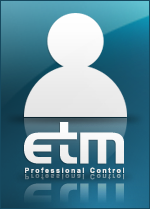 Note: This is no replacement for the Official ETM Support! Does CONTROL support union data types? Probably you can use the CTRL datatype "anytype" to fulfill the requirements. Don't think so. Union types are overlaid structures. They both exist at the same address. Declares a float and 4 bytes at the same address. So you can store a float or 4 bytes into the same address, and access either via the u1 variable. Couldnt this be done using struct? Union and struct (besides memory use) are basically the same thing. Indeed it can. I have done it now. I have used a dyn_anytype and mixed different structures in it. However, as per normal with programming, when one door open another slams in your face. I have a list of structures now stored in a dyn_anytype and would like to sort them alphabetically by a string member which is in both structure types. Structure A has a string "name" as its first member. Stricture B also has a string "name" as its first member. I want to sort the structure list (dyn_anytype) by the name field. dynSort and dynDynSort seem the likely candidates, but they seem unhappy to sort by string types. Sorted it now. Sort will work with string types. However, it won't work with structure members. The solution was to have a dyn_dyn_anytype. The lower "array" would contain string (the name) at index 1, then Structure A at index 2, and Structure B at index 3 (constituting the "entry"). This effectively makes indexes 2 and 3 a union type definition. This dynmaic any type (individual "entry") can then nested in another dynamic any type for the amount of entries required. Then the function dynDynSort(EntriesList, 1); can be used to sort the entries by the name (string).